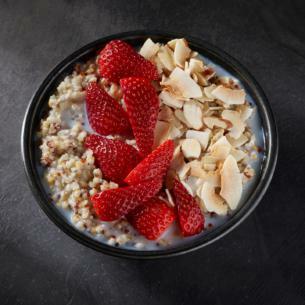 Dig into your day with our overnight grains that include oatmeal, quinoa and chia seeds, plus shaved coconut, strawberries and toasted almonds. overnight oats (coconut milk [coconut milk (coconut, water), guar gum], cooked steel cut oats, sugar, cooked red quinoa, water, chia seeds), strawberries, almonds, coconut. may contain:wheat, soy.